Afraid your career is blocked? 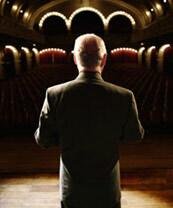 We specialize in helping you overcome of your Extreme Fear of Public Speaking. You will make a “Personal Breakthrough” in ten short weeks of our public speaking classes—or your Money Back. Then you’re just the kind of person we’re looking for. We believe there’s a hero in all of us, including you. At the Stagefright Survival School our mission is to help you transform your extreme fear of public speaking into self-confidence�by providing a safe and supportive environment to learn, practice and master new anxiety management skills. We’ve helped hundreds of mid-career business professionals build their self-confidence, overcome stagefright, and drive their careers to new heights. Why do we highlight extreme fear of public speaking? You know in your heart that the only way you’ll ever be able to overcome your fear is by facing it. But you just don’t know how to do that. You’ve probably spent years dreading demands for you to speak in public. You’ve held on to the wishful thought that one fine day, somehow, you’ll wake up and it will be�all gone! But that fine day never seems to come. You probably got disappointed in yourself and felt more and more hopeless. What usually gets in the way of getting started getting over it? It seems too embarrassing to tell others about it and ask for their advice. Certainly not your boss, your business colleagues, perhaps not even your spouse or best friend. When acquaintances or book authors offer their advice on how to reduce stagefright, it’s all so condescending and obvious. If public speaking training were that easy you’d have done it by now! They seem to assume that your fear can be easily fixed right away during their “Step One,” then off you go to polishing your delivery. They just don’t get it! Who does “get” extreme fear of public speaking? We do! Our Stagefright Survival School specializes in it. In fact, it’s all we do. We’re the experts in overcoming extreme fear of public speaking.